The young couple found the child asleep in an old cushioned chair on the front porch. He was curled against a worn pillow, his feet bare and dusty, his clothes fashioned from rough linen. They could not imagine where he had come from or how he had made his way to their small farmhouse on a dirt road far from town. How is it possible to be both brokenhearted and overjoyed at the same time? That's what the ending of The Boy on the Porch, Sharon Creech's newest title, did to me. I don't want to say any more, lest I give anything away, but wow. It is both a frustrating ending and the perfect ending at the same time. This slim volume is not only small in stature, but also word choice as well, Creech choosing to be quite sparse in the descriptions department. Much was left to the imagination here: the couple John and Marta's background, what they looked like, somewhat of the setting, and even the boy on the porch's backstory. Because of the scant descriptions, the book has an allegorical feel to it and could be paired perfectly with Nikolai, the Only Bear by Barbara Joose to talk about the many different manifestations of what it means to be a family. While the sparse descriptions took some getting used to, Creech really uses this book as a master class in writing with feeling. Writing doesn't need to be dripping with descriptors to convey emotion. 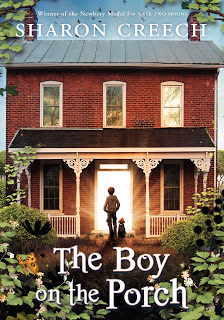 And Creech proved that in spades with The Boy on the Porch, because despite its small stature, this book shows that love, even being such a grandiose emotion in all of literature, in real life, often speaks in whispers, or in the case of the boy on the porch, taps.